Mad Men somehow completely captured an entire generation. Yes, the writing on the show was wonderful, but the costumes and the set design was unlike anything we had ever seen on television before. Looking at stills from the show can still completely take my breath away. So much detail went into Mad Men season after season, and I think we should all take a moment to appreciate the attention that went into the show’s stellar costume design. Keep reading to be reminded of all of the best looks from the show’s seven-season history. The first time we see Joan on Mad Men she’s wearing a fitted red dress that emphasizes both her curves and her red hair. 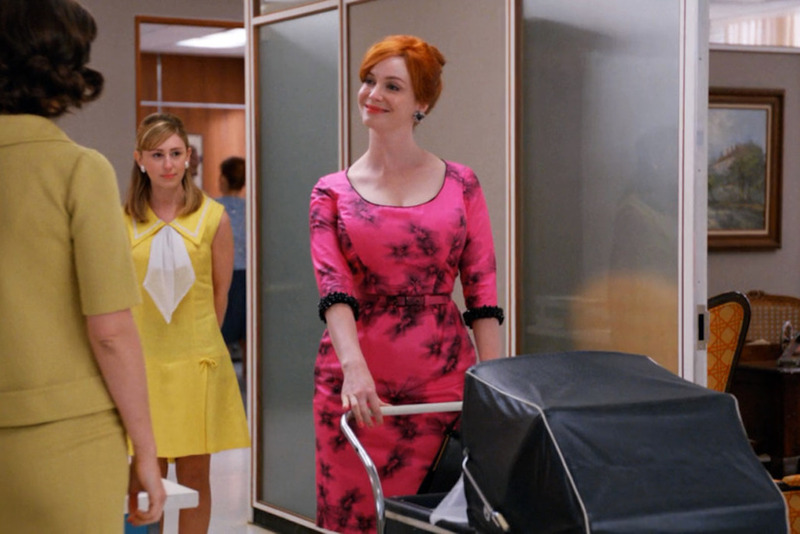 When Joan is reintroduced after she’s been on maternity leave, she shows up to the office wearing this bright pink dress with black detailing. If you thought Joan was an emblem of femininity before, look at her now. She has a baby and a whole new motherly energy.